In this page, we introduce the TAB goods expect videos, CDs and books. We wish to serve you alike. 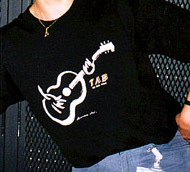 TAB Guitar School T-shirt has been completed. This was illustrated by Mr. Atsushi Hara, a remarkable coming painter. If you see a man who wears this in town, he must be a fingerpicker! In other words he is a brother. Let's talk to and make friends with him. We have this shirt in M & L and in white & black. At the time of an order, Please select size and color.